. Sadogashima 佐渡島 Sado Island - Introduction . (Nowadays it is also held on April 13 - 15. Main festival at the temple Kanmeiji 管明寺 in Sado. Drummers clad as black and white demons with lion masks perform dramatic drum percussions. 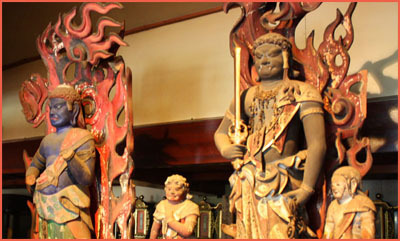 The temple is famous for its two large statues of Fudo Myo-O. In spite of the fame and popularity of the traditional performing art of Sado Island known as Oni-daiko (also called Ondeko, the demon drum dance) relatively little is known about its origins. One story is that in the year 877, during the reign of Emperor Yozei, a Buddhist monk's dance was introduced to the Noto peninsula near Sado Island from China. Another version has it that it originated from the Tang Lion's Dance - also from China - in the 8th Century. It gradually transformed into the Demon Drum Dance as it made its way to Sado. Today there are about 110 Oni-daiko groups on Sado, classified into 3 genres. The Aikawa type (northern) includes the dance of an old man called mamemaki who scatters beans for good luck from a wooden measuring box. 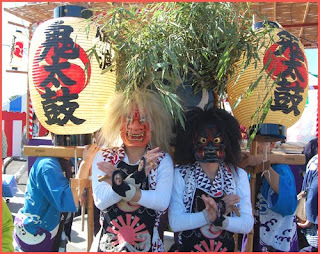 In the Kuninaka (central) variety, there are black and white demons (oni) dancing with 2 lions, and in the Maehama (southern) style, 2 demons dance together to the accompaniment of flute and drum. There are many variations in the dancing styles, but all have in common masked demons dancing to drums. Sometime between 1716 and 1735 Kiyofusa Ukyo Homma arranged the choreography of a Noh dance into a demon drum dance. At the Katagami Ushio shrine he encouraged the local residents to take part. These are the roots of Fanashimo Ondeko. In the late 1850's Rokusuke Sekiguchi - feeling the dancing style had degenerated - went to Kyoto to study traditional court dance and after teaching 3 generations of pupils, the Katagami style of Ondeko evolved. The Kuninaka style is based on this and it spread throughout the central plain of Sado over the next 60 years or so. In the Taisho period (1912-1925) a talented native of Funashimo embellished the dance, bringing it close to how we know it today. Funashimo Onidaiko is also called the 'Shishi Oni Daiko' because both shishi (lions) and oni (demons) appear. the troupe move from door to door in the hamlet driving off evil spirits and praying for an abundant harvest. At night they perform one last dance to the gods of the Hiyoshi Shrine in Niibo, after which a portable shrine (mikoshi) leaves the sacred compound to travel through the village to offer protection. The children of the village strike up a band called the Sagariha. The Funashimo Ondeko group is made up of two people to carry the drum decorated in bamboo leaves and paper lanterns, three rhythm drummers, a male and female demon, and two lions played by two people each. The fearsome demon masks may have originated in Noh theatre or other classical performing arts, but have evolved into their own unique style which vary from troupe to troupe in colour and design. There is a variety of drumbeats played throughout the dance: toyose (stirring), michibiki (guiding), uchikomi (striking), uchikiri (closing), kurebachi ('kure' sticks), hayabachi (fast sticks) and modori taiko (returning drum). Revellers love watching and listening to the variation in drumming styles between the violence when the male demon dances and the softer touch for the female dance. The Ondeko set begins with the toyose. 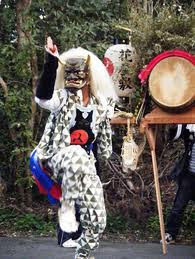 The demon enters dancing and gradually approaches the drum. When the beat changes to hayabachi the dance becomes wilder. Two lions then emerge and attack the demon, trying to keep him or her from the drum. While fighting off the lions the demon struggles to reach the drum. The degree of skill and dramatic flare with which this heroic struggle is portrayed separates the great dancer from the good. According to the elders of Funashimo, the Ondeko was formerly only performed on the official festival day. In 1924 however, an exception was made when it was performed at the reception of a group of luminaries including musicologist Hisao Tanabe, poet and novelist Keigetsu Omachi and Prince Kuninomiya After the performance Mr. Tanabe was so enthused he helped spread the word. On April 15th, at the 5th Annual National Folk Performance Contest, Funashimo Onidaiko performed at the Nihon Seinen Kaikan in Tokyo and since that date the demons have been allowed to perform in public on days other than the festival. It has been 18 years since the the official name of the group was changed from The Young Men's Association, to The Preservation Group. 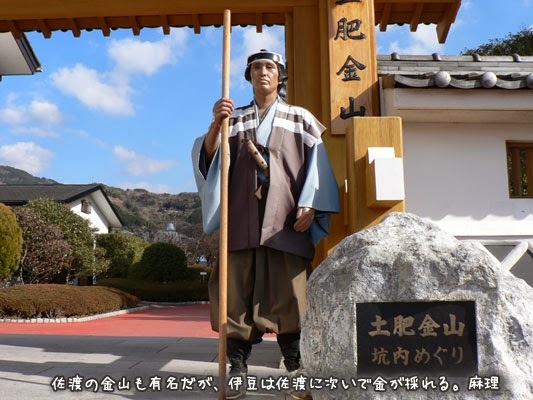 In spite of the keen interest in and support for the group, it hasn't been easy to preserve this and other folk groups in the face of the radical change Japan has known since the war. This is an on-going effort kindled by the passion of each new young generation under the guiding hand of those who have gone before. Thanks to the support of many friends, the Kodo Cultural Foundation was established in 1997 in order to increase the range of activities Kodo could engage in on their home of Sado Island. was a province of Japan until 1871; since then, it has been a part of Niigata Prefecture. It lies on the eponymous Sado Island, off the coast of Niigata Prefecture (or in the past, Echigo Province). Sado was famous for mine silver and gold there. In the Kamakura Period, the province was granted to the Honma clan from Honshū, and they continued to dominate Sado until 1589, when Uesugi Kagekatsu of Echigo Province took over the island. The Tokugawa shoguns later made Sado a personal fief after Sekigahara, and assumed direct control of its mines. Since 2004 Sado city has comprised the entire island. When direct control from mainland Japan started around the 8th century, the island's remoteness meant that it soon became a place of banishment for difficult or inconvenient Japanese figures. Exile to remote locations such as Sado was a very serious punishment, second only to the death penalty, and people were not expected to return. The earliest known dissident to be condemned to exile on Sadogashima was a poet, Hozumi no Asomi Oyu (穂積朝臣老). He was sent to the island in 722, reportedly for having criticized the Emperor. The former Emperor Juntoku was sent to Sado after his role in the Jōkyū War of 1221. The disgraced Emperor survived twenty years on the island before his death; and because he was sent to Sado, this emperor is known posthumously as Sado-no-in (佐渡院). He is buried in the Mano Goryo mausoleum on the west coast. The Buddhist monk Nichiren Daishonin was sent to Sado for three years before his 1274 pardon. The Noh dramatist Zeami Motokiyo was exiled on unspecified charges in 1434. The last banishment in Sado took place in 1700, almost a millennium after the first. Sado experienced a sudden economic boom during the Edo era when gold was found in 1601 at Aikawa (相川). 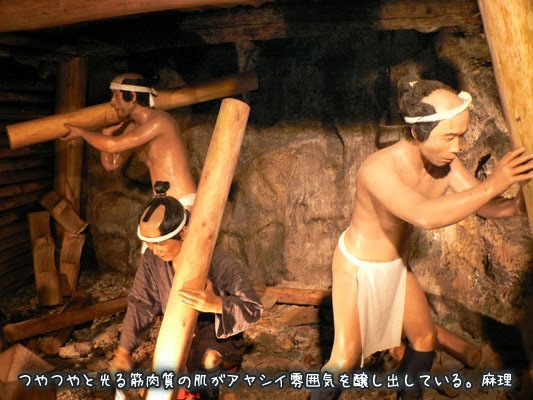 A major source of revenue for the Tokugawa shogunate, the mines were worked in very severe conditions. To make sure the workers did not smuggle any gold out of the mines, there were guards at the entrance/exit.
. Matsuo Basho - Oku no Hosomichi . yukitake 裄丈 the length of a sleeve from the neck to the wrist. 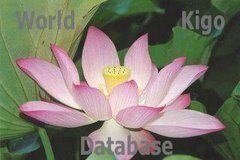 The exiled persons all got the same size of a light kimono and had to make do.
. awase 袷 light linnen kimono . A group of mostly traditional artists from Tohoku put on a show Monday at the U.N. headquarters to display solidarity with disaster victims around the world. The event included performances of the "wakumizu kagura" dance from Tono, Iwate Prefecture, and "wadaiko" drumming by the Ondeko-za group. The Japan Foundation jointly organized the show and said the performances ahead of the first anniversary of the March 11 quake and tsunami were dedicated to victims of disasters and conflicts around the world.